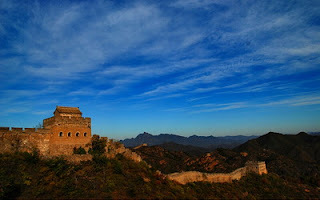 Heilou is on the western part of the Jinshanling Great Wall, about 100 meters east of Shalingkou. First built of wood during the Longqing reign period (1567-1572) of the Ming Dynasty by Qi Jiguang, the tower, soon after its completion, was struck by lightning in 1578 and destroyed. Later, it was rebuilt as a brick-and-stone structure. The two-story two-barrel-vault tower is 11 meters long from the east to west, 9.1 meters wide from north to south, and 7.8 meters high. Its foundation was built with eight layers of stone slabs. Its body is brick-encased rammed stone blocks, loess and lime. Three embrasures with granite sills are set in each of the northern and southern walls, and two each in the eastern and western walls. The floor of both stories is paved with square bricks, and between the two stories is a vertical shaft through which the soldiers could go up and down by a wooden or rope ladder. The soldiers’ living quarters were on the second story. The tower is still in good shape. The western door of Black Tower is in the ground, and was covered with a plank in case of attack. It also served as an escape hatch in case the tower was captured. There are two stories about how the tower got its name. one is that it was blackened by lightning, and the other is that when Qi Jiguang was in charge of the construction of the Jinshanling Great Wall, an old general led his men to join the construction from Ningxia, bringing with him his only daughter, Heigu. Everybody adored Heigu, who joined in the building of the Great Wall, and often washed, sewed, and mended clothes for the soldiers. Soon after its completion, the watchtower was struck by a thunderbolt, and caught fire. Disregarding her own safety, Heigu rushed to put out the fire, but was burnt to death. The rebuilt tower was named after Heigu (Hei means “black”).